This model of the legendary king of Scotland builds into a striking mounted figure that any Scot, with any sense of history, would be proud of. The King's features are particularly well defined and it is easy to imagine that the man himself looked like this. This is quite a large model and it makes a colourful centre of attraction on display. 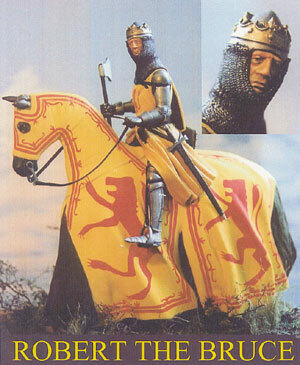 Our model is based on the famous statue of Robert the Bruce at Stirling. The painting instructions offer a relatively simple way of replicating the lions that appear on the caparison of the horse.